43-year-old Claudia Schiffer, German supermodel, actress and UNICEF Goodwill Ambassador of the United Kingdom became the main heroine of the colorful advertising campaign of Dolce & Gabbana Fall/Winter 2014-2015, replacing Italian actress Monica Bellucci and fellow supermodel, Eva Herzigova. The images of the Fall 2014 ad campaign reminiscent of medieval tales, each of which has all the necessary attributes : a magical forest, delicate princesses in chic dresses, crowns, covered with stones, and even an enchanted apple in the hands of the beautiful Schiffer. 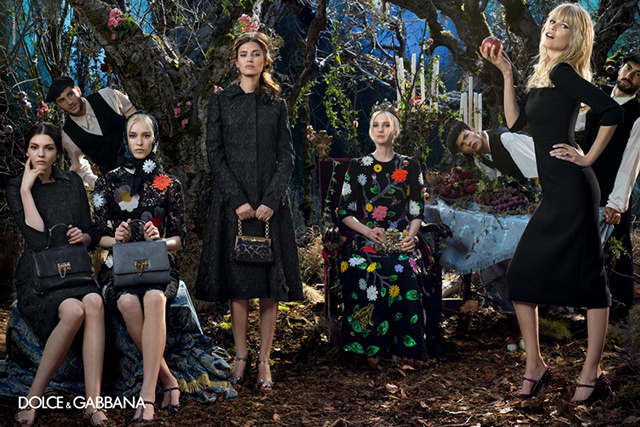 The forest theme became a popular locations for shooting their ad campaigns this fall, first Dior and Alberta Feretti and now Dolce & Gabbana. Together with Claudia in front of Domenico Dolce’s camera were also posing Italian model Bianca Balti, Vittoria Ceretti and Nastya Sten. I love the neckline cut of her black dress. She is so gorgeous! So was Monica! I totally love this collection. And Claudia looks really beautiful in it. I agree – love the collection, and Claudia looks amazing in it – so glad to see her again!